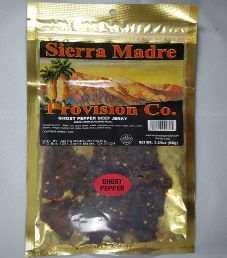 The next review on Sierra Madre Provision Co. will focus on a 3.25 ounce/92 gram bag of their ghost pepper beef jerky flavor. 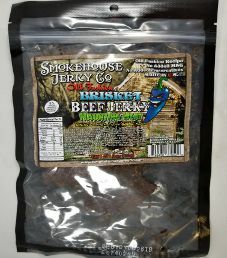 This jerky was graciously submitted by the creator of this Sierra Madre Provision Co. jerky brand, James Schaft (a.k.a. – Jimmy the Jerky Man). 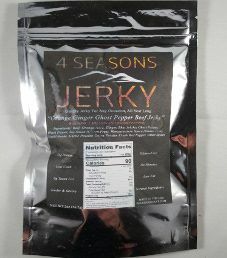 The next review for 4 Seasons Jerky will focus on a 2 ounce/56.7 gram bag of their Orange Ginger Ghost Pepper flavored beef jerky. This flavor is described as the ghost pepper packing quite the punch, marinated with orange juice and ginger. The owner Thom Le, which is short for Thomas, graciously submitted this bag of jerky for review. 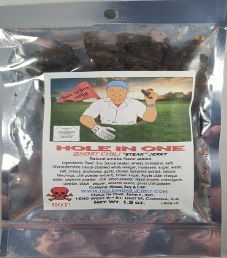 The next review for Hole In One Jerky will focus on a 1.5 ounce/42 gram bag of their ghost chili flavored steak jerky. This flavor is described as being super flavorful, where the ghost pepper flavor sneaks up on you. The bag was kindly submitted for review by the owners, Bud & Crystal Ott. 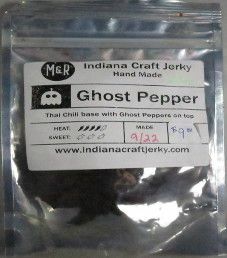 The next review on Indiana Craft Jerky will be on a 2.5 ounce/71 gram bag of their ghost pepper beef jerky flavor. This jerky was graciously submitted for review by the president of Indiana Craft Jerky, Michelle Twaddell.